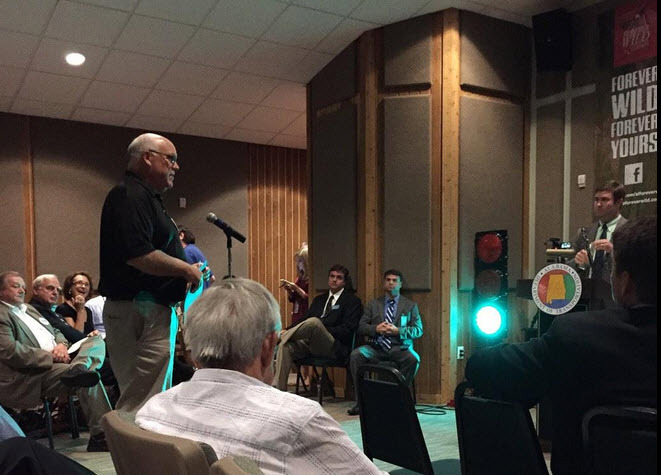 The second Alabama Department of Transportation (ALDOT) public hearing about the I-10 Bridge Environmental Impact Statement was held Monday, September 29th, at Five Rivers Delta Resource Center. The hearing followed a similar format as the one held September 23rd, providing the public the opportunity to browse visual displays pertaining to the I-10 bridge project and provide comments during the public forum. The Build the I-10 Bridge Coalition, with support from Coastal Alabama Partnership (CAP), offered buttons, fans, and bumper stickers stating “Build the I-10 Bridge NOW” to those entering the hearing. 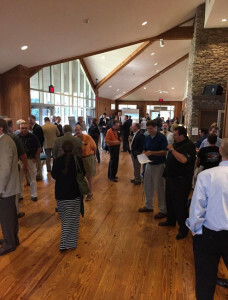 The large majority of those who spoke during the public forum, including elected officials from Baldwin County, advocated for building the I-10 bridge and quickly. 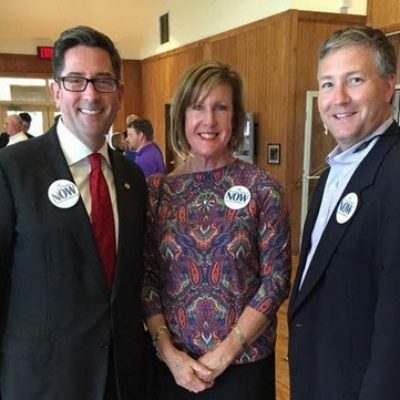 The Baldwin County Commission voiced support for the project with representation from Commissioner(s) Skip Gruber, Chris Elliott, and Tucker Dorsey. Commissioner Gruber stated that “the I-10 bridge project is the most needed project in the whole southeast region” and Commissioner Dorsey stressed that this project is “critical to our economic wellbeing in coastal Alabama.” Commissioner Elliott added that “this is an acute problem” and the bridge needs to be “built now, not 20 years from now.” Baldwin County mayors also articulated support for the bridge project, including Mayor Michael McMillan with the City of Spanish Fort and Mayor Dane Haygood with the City of Daphne. A few citizens expressed concerns about the project. Ms. Callaway asked ALDOT to carefully manage stormwater runoff due to the bridge and to look into how a hazardous spill on the bridge would be contained quickly. Mobile resident Bob Hanks voiced concerns for the bridge’s impact on downtown Mobile and advocated for Alternative C as the optimal route. Thank you to everyone who attended the public hearing and provided comments. The 45 day comment period runs through Nov 7th. To view the DEIS and provide comments, please go to mobileriverbridge.com. We encourage you to submit your input as this project is vital to our region’s wellbeing. In addition, please check out www.buildthei10bridge.com for latest news and to join the coalition in support of the bridge.